Just back from a wonderful 6 weeks in Oz, including close to 3 weeks in the Byron Bay area. What a magical time and place! I was in Byron partly holiday and partly to do a 5 day portrait painting workshop with New York artist David Kassan. The day after the workshop, I went out plein air painting with another participant and fine artist, Mac Robertson. 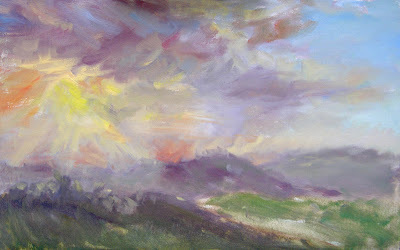 This quick oil sketch was done one sunset in the Goonengerry hills after a day of shower storms. We had a wonderful day. Lots of fun driving around scouting locations in an area we'd never been before in his van that was totally decked out for painting. It was totally fun to paint outdoors with like-minded company and, for me especially, in the beautiful wide open vistas of the Australian landscape that I have dreamed to return to. I could easily have spent a week or more just driving around painting, but alas that will have to wait for some other time. It's still early days for me with outdoor landscape painting, next trip to Oz I will definitely make time to get out there again more than once. I've now got a basic oils kit to take out with me that I'm leaving there waiting for my return. I also wound up recording vocals in Goonengerry on several tracks of a CD project for Israeli composer/musician Avisahi Barnatan, co-founder of internationally renowned world music group, Sheva. I can't wait to hear what he does with it, the music is lush and inspiring, and it was a total joy to sing on it and work with him. There seems to be a wonderful creative network of people in the northern rivers area inspired, no doubt, by the stunning country with it's hills, rainforests and miles of beaches. I have a feeling I'll be spending more time there in the future. Very good paintings. Thanks for sharing them. Let many more people see your work! Beau-ti-ful! Have you drawn a self-portrait before? Julianne, this is a great little piece... very nice sense of light and I like the way you've done the sky. It must have been nice to get back to OZ!! Hey there Roo! Thanks for visiting and commenting! Tomorrow I'll be on the gold coast for a couple of days but not getting as far north as Brizzy this time. But yes, I'd love to hook up on some future trip! And thanks Mike and Bob. For some reason I seem to have missed your comments from god knows how long ago!